Previous clubs: Halesowen, Dagenham & Redbridge, Rushden & Diamonds, Farnborough Town, Aldershot Town. 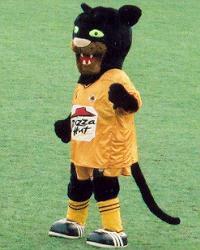 Pilgrim the Panther became Boston United's mascot following a competition run by BBC Radio Lincolnshire and BBC Look North, when various characters were proposed as the new mascot. Pilgrim is sponsored by Pizza Hut. After studying part-time at Keele University, Jim became a qualified FA physiotherapist through attending a course at Lilleshall. He then joined Boston on a part-time basis when they were in the Dr Martens League. After leaving Boston and spending a few seasons as Grimsby Town's Reserve and Youth team physiotherapist, he returned to the club in 2001. He is the brother of former Norwich City and England goalkeeper Chris Woods. As a teenager he represented Great Britain at clay pigeon shooting. Paul is a highly regarded goalkeeper and is now in his twelvth season with the club after joining United from Kettering Town in 92-3. First choice keeper for Boston United, "Bazza" was voted "Player of the Year" for the second time after finishing the season by equalling the all-time appearances record for the club - turning out for the 572nd time. Always popular with both home and away supporters, he had an outstanding season, making many spectacular saves, often at crucial moments and keeping 15 clean sheets. Paul is one of the few United players to have settled locally, living in the town with wife Ann (a Bostonian), and children Laura and Callum. He said "becoming a father has changed me because I have grown up and steadied down and it has taught me a lot about myself." Previous clubs: Scunthorpe United, Grimsby Town. 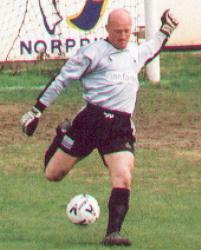 Steve Croudson was signed just before the start of the 2003/4 season to provide goalkeeping cover, after extensive trials during pre-season matches. 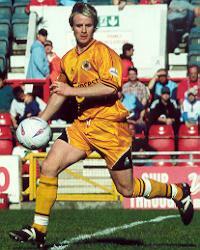 He had previously been with Scunthorpe United and Grimsby Town, having made 9 League appearances. 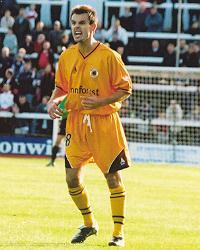 Ben Chapman was signed up from Grimsby Town after being released in the summer of 2002. 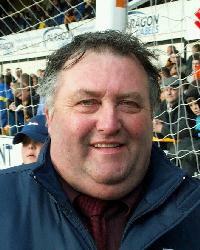 He had been with Grimsby since 1997, having joined as a trainee. In his five seasons with the Mariners he had made 21 League appearances. 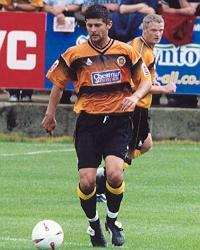 A central defender who was Boston United's record signing when he joined the club from Scarborough one day before the start of the 2001/2 season. He joined Scunthorpe United on leaving school but was released at the end of the 93/4 season. He was snapped up by Gainsborough Trinity where he was a great success. Moves to Altrincham and Scarborough followed, and at each club he has played at he has become an instant hero with the fans for his commanding displays. He has shown great versatility since joining Boston, playing in defence, midfield and even as an emergency striker. Took over as team captain from Ben Chapman halfway through the season. Previous clubs: Celtic, Charlton Athletic, Wigan Athletic, Oldham Athletic, Scunthorpe United. 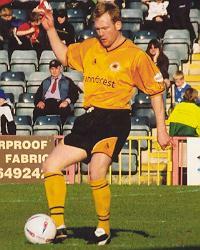 Experienced defender Stuart Balmer was signed up on-loan by Boston United from Oldham Athletic in December 2002 to provide defensive cover following an injury to Mark Greaves. He had played against Boston earlier in the season whilst on-loan with Scunthorpe United. When his loan period ended he was soon signed up for the rest of the season. Overall he had previously made 364 League appearances, scoring 18 goals. Previous clubs: Sheffield United, Hull City, York City. 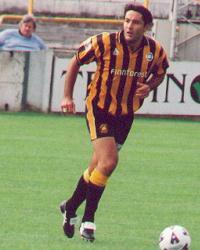 Matt Hocking joined his home-town club on a free transfer when his contract with York City expired in the summer of 2002. He had started his footballing career with Sheffield United, but moved on to Hull City after failing to break into the "Blades" first team. After two seasons at Hull he had a loan spell with York City at the end of the 98/9 season which ended with a permanent move to the "Minstermen" for the following season. Overall he has made 154 League appearances, scoring 4 goals. After impressing in trials with the reserves, Lee Beevers was signed on loan from Ipswich Town until the end of the season just before the transfer deadline in March 2003. After making his first team debut when coming on as a substitute for the last few minutes of the final game of the season at Cambridge United, he signed up with Boston for a further year. After impressing in trials with the reserves at the end of the 2002/3 season, Ryan Clarke was offered a contract and he signed up in the close season. He had previously been a scholar at Notts County. Previous clubs: Wigan Athletic, Bolton Wanderers, Blackpool, Stoke City, Motherwell, Cheltenham Town, Scunthorpe United, Bury, Hull City. 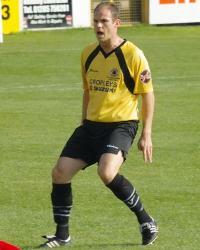 Defender Greg Strong joined Boston United from Hull City in March 2004. A former England schoolboy and youth international, Greg started his footballing career with Wigan Athletic in 1992. He then moved to Bolton Wanderers, but after failing to establish himself in the first team he moved north of the border to play for Scottish League Premier Division side Motherwell. 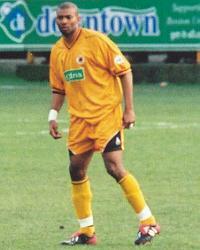 He returned to England in 2002 when he was signed up by Hull City. He has since had loan spells with Cheltenham Town, Scunthorpe United and Bury. Previous clubs: Aston Villa, Wolverhampton Wanderers, Stockport County, Walsall. 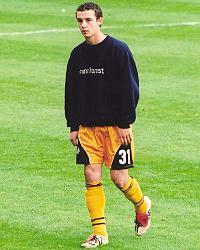 Tom Bennett joined Boston United in the summer of 2002 after being made available by Walsall. He had started his footballing career as a trainee with Aston Villa. 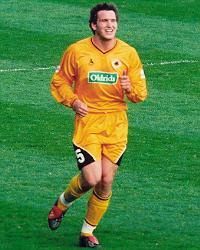 After one season with Villa he moved on to Wolverhampton Wanderers, where he stayed until 1995. He then signed up with Stockport County. For the last three seasons he has been with Walsall, where he was team captain. Overall he had made 341 League appearances, scoring fifteen goals before joining Boston. 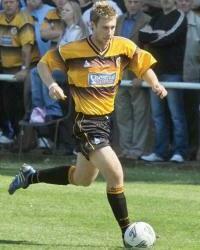 Midfielder Steve Melton joined Boston United from Hull City in March 2004. He can play in either in the centre or right side of midfield. During his League career he has made 99 first team appearances scoring five goals. 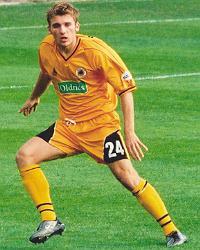 Lee Thompson was signed up from Sheffield United on a month's loan in October 2002. A former England Schoolboy international, he had yet to make a first team appearance for the "Blades". He scored a spectacular winning goal in his second match for Boston, when a long range shot from the right wing curled over the keeper and into the net. When his loan period finished he was keen to gain more first team experience with Boston, so he signed up with the Pilgrims. 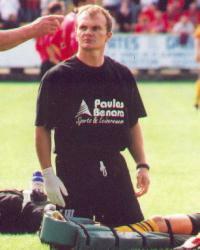 Schoolboy Lloyd Freeman was brought into the first team squad in October 2003 to provide cover following a spate of injuries that reduced the available players to the bare bones. He had already played a few games for the Reserves and is a member of the club's Centre of Excellence. He is at Kesteven School, Lincoln. Previous clubs: Bridlington Town, Doncaster Rovers, Wigan Athletic, St. Johnstone, Southend United. 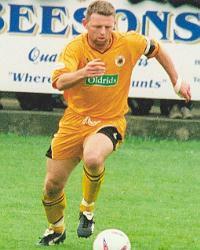 Striker Graeme Jones signed up for the Pilgrims in March 2003 after obtaining release from his contract with Southend United. 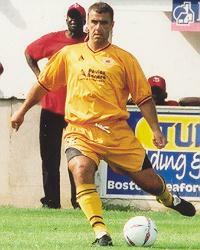 He had previously played for Bridlington Town, picking up an FA Vase winners medal in 1993. He stepped up into the Football League with Doncaster Rovers and Wigan Athletic before going "North of the Border" to play for St Johnstone. He scored on his debut for the Pilgrims with a stunning volley from the edge of the area. Previous clubs: Walker Central, Sunderland, Oxford United, West Bromwich Albion, Darlington, Queen of the South. 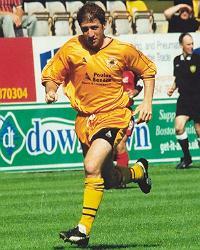 Boston United signed up Mark Angel from Darlington in June 2001. A skilful winger in the traditional mould, he had been on-loan at Queen of the South for much of the previous season. Previous clubs: Sheffield Wednesday, Worksop Town, Gainsborough Trinity, Lincoln City. Dene Cropper was signed up from Lincoln City in March 2004. He had begun his footballing career as a scholar at Sheffield Wednesday, before joining Lincoln City in May 2002. He made 55 first team appearances for the Imps, scoring 3 goals. 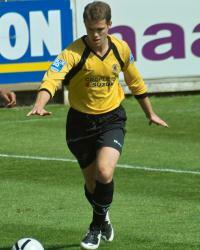 He has also had loan spells with Worksop Town and Gainsborough Trinity. Previous clubs: Luton, Oxford United, Rushden & Diamonds. 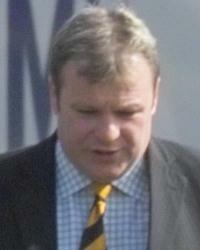 Stuart Douglas joined Boston United on non-contract terms in August 2002. He had previously spent seven seasons with Luton Town and also had loan spells with Oxford United and Rushden & Diamonds. 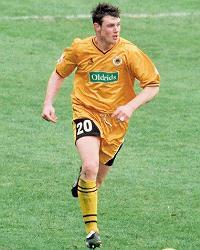 Kevan Hurst joined Boston United on loan from Sheffield United at the end of March 2004. He had joined the "Blades" as a trainee in July 2003. A regular in Sheffield United's under 19s side, and had made one appearance for their first team in a Carling Cup match. Previous clubs: Arsenal, Colchester United. 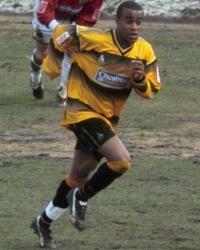 Former Arsenal striker Jermaine Brown joined Boston United from Colchester in February 2004. 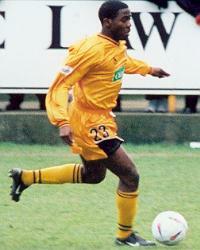 He had joined Arsenal as a trainee in August 2001 and had moved to Colchester in October 2003. He had made one first team appearance for Colchester, scoring the winning goal after coming off the bench in extra time in their LDV Vans Trophy match against Wycombe Wanderers. He had also been on-loan at Crystal Palace, playing in their reserve side. Scott Brough joined Boston United on non-contract terms in October 2003 after a long trial period that began pre-season. 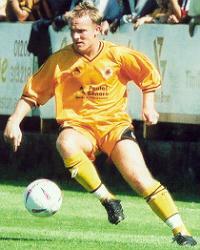 He had previously made 57 first team appearances for Scunthorpe United, scoring three goals. Previous clubs: Middlesbrough, Sheffield United, Halifax Town, Rotherham United, Blackpool, AFC Bournemouth, Stockport County, Crewe Alexandra, Hamilton Academicals, Airdrieonians, Raith Rovers, Darlington, York City. 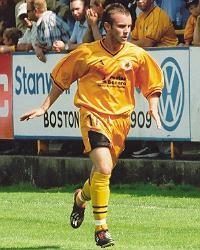 Much travelled striker Peter Duffield joined Boston United at the end of January 2003 after being released by York City. A proven goalscorer, he had previously scored 153 goals in 389 first team appearances, including one for York City against Boston earlier in the season. Previous clubs: Ajaccio, Nimes, Wasquehal, Swindon Town, Queens Park Rangers. Frenchman Eric Sabin was signed up on a month's loan from QPR in March 2004. Eric is a strong centre forward with lots of pace. Previous clubs: Nottingham Forest, Hull City, Scarborough, Ipswich Town, Barnsley, Oldham and York City as a player and York City and Scarborough as manager. Joined the club from Scarborough to help with the coaching. He was later drafted into the Boston first team after all the regular defenders were ruled out due to injury or suspension and ended up playing four times during the season. He was given the managerial reins when Steve Evans was suspended by the club after charges were brought against him by the FA. He had a creditable first season in charge by overcoming the four point deficit imposed by the FA and steering the club to mid table respectability. Previous clubs: Birmingham City, Wycombe Wanderers, Stoke City, Southampton, West Bromwich Albion, Northampton Town, Reading, York City. 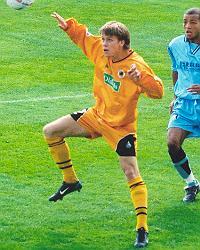 Experienced defender Graham Potter was signed up in the summer of 2003 from York City. A left sided player who can play in either defence or midfield. A former England Youth and Under-21 International. He started his footballing career as a trainee with Birmingham City. He was later transferred to Stoke City for £75,000, followed by a move to Premiership Southampton for £250,000 - where he made ten first team appearances. After six months with the "Saints", West Bromwich Albion snapped him up for £300,000. He had made 236 League appearances, scoring 8 goals before signing for Boston. 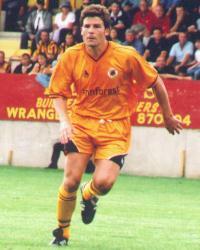 Andy White was signed up on a month's loan in September 2003. 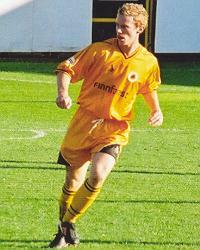 He started his footballing career with Hucknall Town, but was soon snapped up by Mansfield Town. 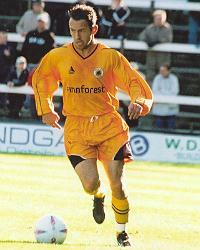 He has scored 11 goals in 66 appearances, including 29 as substitute for Mansfield. Previous clubs: Atlantas Klaipedas, Barry Town. 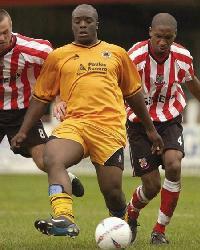 Adebayo Akinfenwa signed up with the Pilgrims in October 2003 after impressing in trials with the Reserves. 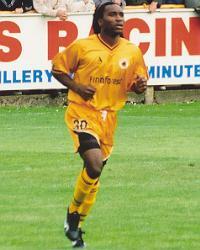 He had previosuly played for Welsh Premier League champions and Welsh Cup winners Barry Town. Prior to that he had turned out for Atlantas Klaipedas of the Lithuanian Virsliga. He scored a goal for Atlantas in their Lithuanian Cup Final victory. 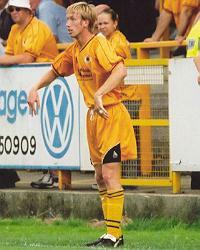 He scored on his debut for the Pilgrims, grabbing a last minute winner against Swindon Town in the LDV Vans Trophy. Previous clubs: Ipswich Town, Cambridge United, Torquay United. 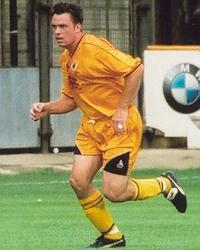 Richard Logan was signed on a one month contract in November 2002 after being released by Ipswich Town. 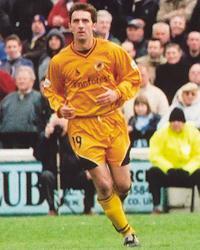 Richard had joined Ipswich as a trainee in August 1998 and had made five substitute appearances in the first team. 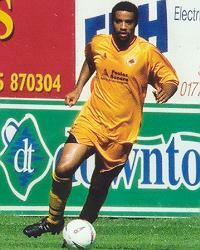 He had also had loan spells with Cambridge United and Torquay United. After extending his loan spell with Boston, he ended up the season as the club's top scorer with ten goals to his credit in 26 appearances. Previous clubs: Sheffield Wednesday, Queens Park Rangers, Chester City, Stalybridge Celtic. Alex Higgins was signed up on non-contract terms in October 2002. He had previously made one League appearance after coming on as a substitute for the last ten minutes of a match for Queens Park Rangers. A young striker signed from Oxford United on a free transfer in February 2001. He settled well into the side and soon got on the scoresheet, producing five goals in his thirteen starts in his first season. His impressive form continued into his second season with the club, resulting in a trial with Bolton Wanderers. He came through the youth scheme at Oxford, and was offered a professional contract at the club when just seventeen years old. He scored his first League goal in the dying seconds of a match against Nottingham Forest, after coming on as a substitute. Overall he made 56 League appearances, scoring 4 goals for Oxford United. 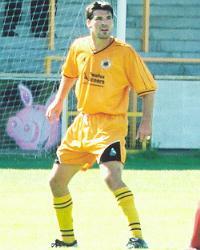 Adam Boyd joined Boston United on a month's loan from Hartlepool United in November 2003. 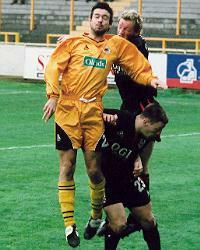 Adam had joined Harlepool as a trainee in August 1999 and had since made 76 first team appearances, scoring 15 goals. Previous clubs: Nottingham Forest, Bolton Wanderers, Lincoln City, Doncaster Rovers, Crystal Palace, Watford, Oldham Athletic, Barnsley, Charlton Athletic, Bradford City, Wigan Athletic, Halifax Town. 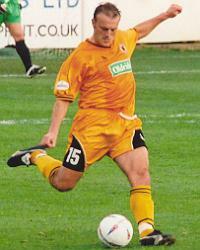 Experienced midfielder Neil Redfearn joined Boston United in the summer of 2002 after being released by relegated Halifax Town. Overall he has made 701 League appearances, scoring 146 goals. He had seven seasons with Barnsley, which saw them twice win promotion, first to Division One and then to the FA Premiership. A £1 million transfer to Charlton Athletic followed, before moving on to Bradford City, Wigan Athletic and Halifax Town. Previous clubs: Norwich City, Southend United. Daryl Sutch was signed up from Southend United in the summer of 2003. A former England Youth and Under-21 international, Daryl had previously been with Norwich City for thirteen seasons, having joined them as a trainee in 1990. He made a total of 365 first team appearances for the "Canaries" and the "Blues", scoring 10 goals. He was a member of the Norwich City team that beat Bayern Munich in the second round of the UEFA Cup in November 1993, before being narrowly beaten by eventual champions Inter Milan in the following round. He is a versatile player who can play as a right or centre back or in midfield. Previous clubs: York City, Ipswich Town. Signed on a month's loan in October 2003 to cover for injuries in the squad. He had started his footballing career as a member of York City's youth team, but he switched to Ipswich Town in June 2001 for a six figure fee. He had previously been captain of the England Under-15 side. He has also recently played for the England Under-19 side. He was released by Ipswich shortly after his loan period with Boston ended and he was subsequently signed up on a further loan spell by the Pilgrims. 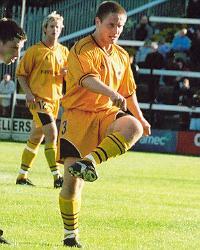 Sam Morrow joined Boston United on loan from Ipswich Town in December 2003. He had joined Ipswich as a trainee in July 2003 and had made one appearance for their first team in a Carling Cup match. He has represented Northern Ireland from Under 14 to Under 20 level. Photographs copyright © Ken Fox, 2003.